The yearly get together for members of ARTnudes Network has ended. We’ve gone to Australia and back again and are now starting to edit all of our images. There has really been some great work uploaded to our group blog. Please stop by and have a look! 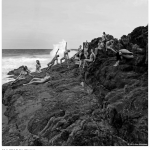 16 photographers and 14 models and beautiful locations. Here are a few quick peeks from what’s been posted on the blog so far. Images by, Cam Attree, Jim Furness, Michael Marlborough, Mel Brackstone and Zoe Wiseman. You’ll have to go to the blog to see them all and see these images in full splendor. « Parallelograms – Jeff Enlow – a polaroid portrait project	» The 13th Zoe Fest in Kauai, Hawaii!